Local 986 has grown to be the largest local union in the Western United States through outstanding leadership, vigorous organizing, negotiating and enforcing quality contracts, and their dedication to serve the members. Local 2707 brought in the all-important airline industry and a geographic jurisdiction that expanded to include members from the Pacific Northwest to Hawaii, Guam and Saipan. Local 420 construction workers and rock and sand, and Local 578 paper steel and warehousing and Local 389 had the convention center industry. Local 982 and Local 381 expanded our geographic jurisdiction to the north, and now Local 995 into hotel and casino industry, rental cars and administrative offices in Southern Nevada. Each new group, whether they joined via organizing or a merger, has quickly become a part of Local 986. Today’s leaders continue to build on Local 986’s legacy of strong leadership. Secretary-Treasurer Chris Griswold rose through the ranks from Operations Agent at PSA Airlines, to shop steward, to Business Agent, to Executive Board member and principal officer. In his 30 years as a Teamster, he has proven to be an excellent administrator and negotiator, always sensitive to the needs of the membership. President Sean Harren is the ideal person to co-lead the local. He has the crucial experience and education, plus the willingness to put in hard work and long hours. He is popular with the membership because of his aggressive attitude in contract negotiations and handling grievances. As the Executive Administrator, he oversees some of the finest coordinators and business representatives of any local union. With its superior representation, dynamic shop steward training and a real pride of membership, it is no wonder Local 986 is one of the most respected and effective local unions in the nation. 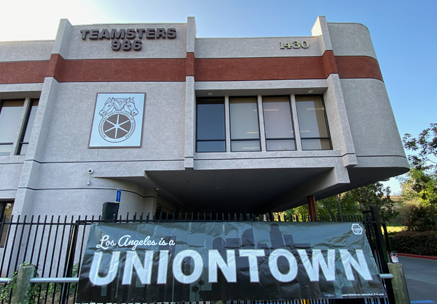 Teamsters Union is North America's strongest and most diverse labor union.